The playoffs are underway, and the Oshawa Generals having been making quick work of their arch-rival, the Peterborough Petes. “Everything’s going our way right now, but it’s a long process,” says Generals general manager and vice president Roger Hunt. Starting off game two of the series on March 24, the Gens came out of the gate flying as it took a mere 31 seconds for Danil Antropov to hand his team the lead with his first goal of the playoffs. It was only a few minutes later when Nicholas Mattinen took a shot from the point to beat Petes goalie Hunter Jones to add the Gens lead. The Gens didn’t slow down as only seconds later Ty Tullio took a shot from the side of the net for his first playoff goal and to give the Gens a 3-0 lead as Jones was pulled after allowing three goals on five shots. Heading into the second with a sizable lead, the Gens took a penalty and allowed a goal to the Petes’ Christopher Paquette before Kyle MacLean responded by sniping a shorthanded goal past Petes backup goalie Tye Austin to make it 4-1. The third period started of much like the first with Allan McShane put a rocket past Austin only 32 seconds into the period. Anthony Salinitri, the Gens top goal scorer this season, took less than a minute to shoot a one-timer past every Pete to give the Gens a 6-1 lead. Another 32 seconds later, Cole Resnick added another when he took a shot from the slot, giving the Gens their third goal in just over one minute. After the Gens killed off two penalties, Dustin Hutton put one past Kyle Keyser for the Petes’ second goal of the night. That would be all however as Tullio scored his second of the night to make the final score 8-2. After taking home the victory in game two of the series, the Gens also took home all three stars-of-the-game. The first star went to Salinitri as he had a goal and an assist, the second went to McShane as he had a goal and an assist, and the third star went to Tullio with his two goals. The Gens outshot the Petes 32-27, and went 1-for-4 on the powerplay. In earlier action the Gens kicked off the playoffs hoping to continue their strong season into the playoffs. The first period started with Salinitri took a pass from McShane in the offensive zone and put it in the top corner past Jones to give Oshawa the early lead. Later in the period, Nando Eggenberger slapped home a loose puck in front of the visitor’s net to make it 2-0 after 20 minutes. The second period started even faster than the first with Brett Neumann only taking a minute and a half to bury one from the Petes’ crease to further add to the lead. Much like the first period, it took a while but the Gens scored again when Brandon Saigeon tipped a point shot from Mitchell Brewer past Jones to make it 4-0 in favour of the Gens. The third period was a little different for Oshawa as they did not score again until just over halfway through the period when MacLean waited and deked Jones to give the Gens a commanding 5-0 lead. Neumann would then score his second of the night, followed by a goal from Ian Blacker to give the Gens a 7-0 victory in game one of the playoffs. Oshawa outshot Peterborough 47-33 while also going 1-for-3 in the first game of the playoffs. All three stars went to Generals, as Keyser was the first star after stopping all 33 shots, Saigeon was the second star with a goal and two assists, while Neumann was the third star with two goals. He says he doesn’t think a team is really in trouble in the playoffs until losing a home game, so he believes Peterborough isn’t too worried as they head home for the next two games. Game three of the series took place on Tuesday evening after The Express’ print deadline, while game four is in Peterborough on Thursday, March 28. 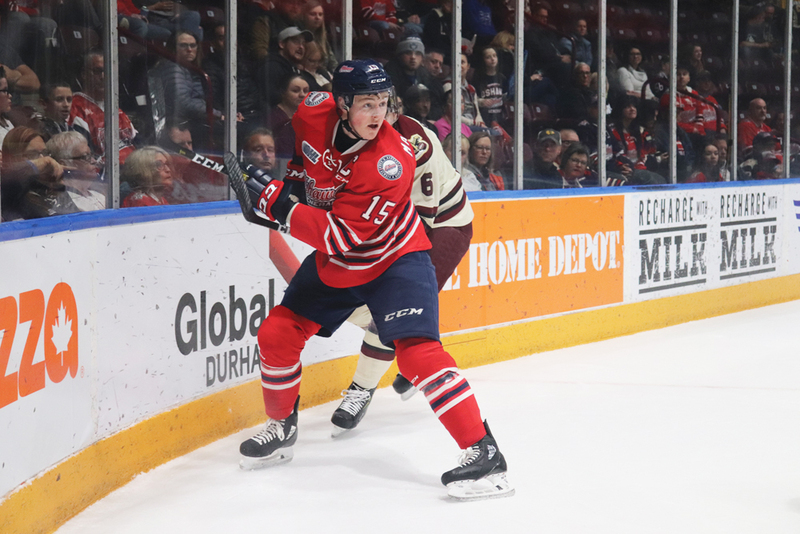 If needed, the Gens will return home for game five on March 30 at 7:05 p.m., will be in Peterborough for game six on Sunday, March 31, and will have game seven at home on Tuesday, April 2 at 7:05 p.m.